Cardboard beaches, bacon explosions, and music heavyweights turn up at the festival's outdoor King West venue. 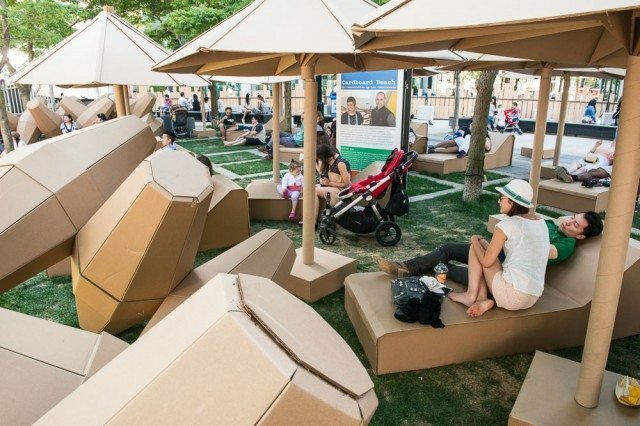 Kicking back at the <em>Cardboard Beach</em>, created by two-man Cuban collective Los Carpinteros. The food and drink area, full of eager festival-goers on the hunt for The Bacon Explosion. Lineups for the <a href="http://torontoist.com/events/event/luminato-2014-preview/" target="_blank">Taste of the Beach</a> event. Pork loaves (logs?) used in The Bacon Explosion—a explosion of bacon brought to you by Pork Ninjas BBQ & Catering Team + Brennan Hall. Every cardboard beach needs a cardboard lifeguard hut. An interview with <a href="http://luminatofestival.com/festival/2014/Adrian-X" target="_blank">Adrian X</a>. We would happily exchange most of our furniture for cardboard furniture constructed by Los Carpinteros. And this is that Bacon Explosion we were talking about earlier. Nothing helps cool you down after a Bacon Explosion better than a coconut gelato treat. A Toronto crowd welcomes The Roots. WHAT: Luminato‘s Festival Hub, which will, until June 15, play host to a range of foods, musical performances, and art works until Luminato says so long until next year. Over the next few days, you’ll be able to catch acts like TV on the Radio, scarf down a Bacon Explosion, and get beachy in deck chairs made entirely of cardboard.